The Endeavour, a replica of Captain James Cook's ship of discovery, lies at anchor in Botany Bay at Sydney, Australia, April 17, 2005. Researchers believe the wreckage of the ship Cook used to explore around the world is submerged somewhere in Rhode Island's Newport Harbor. 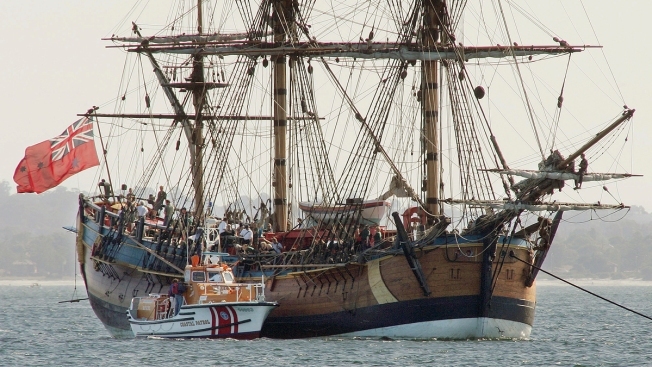 If it is the Endeavour, the ship would belong to the state of Rhode Island, because of the state's legal maneuver in maritime court nearly two decades ago based on an obscure, centuries-old maritime practice. If the ship legendary explorer Capt. James Cook used to sail around the world is found at the bottom of Newport Harbor, Rhode Island will own it outright because of a legal maneuver it took nearly two decades ago based on an obscure, centuries-old maritime practice. In 1999, Rhode Island went to federal court in Providence to do what's known as "arresting" the shipwrecks in the harbor - having the government take possession of them so a federal court could consider the state's ownership claim.